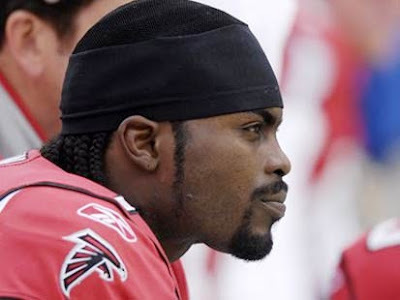 Michael Vick just said verbatim in his press conference, "I have found Jesus in this process and I feel that is the best decision for right now. I need forgiveness and I know I can be redeemed." 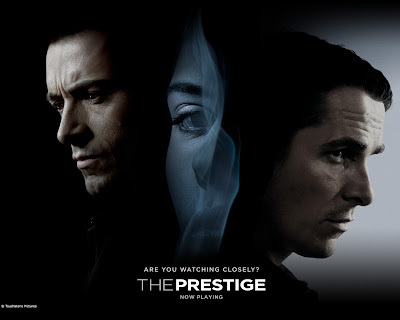 I was fortunate enough to watch The Prestige last night. This movie is absolutely fantastic. A stellar cast included Christian Bale, Hugh Jackman, David Bowie, Scarlett Johansson and Michael Caine. Aside from brilliant acting a mind-blowing script made this movie one of the best I've seen in quite some time. I will definitely be watching this again soon. Word of wisdom if you haven't seen it: go into it blind. Don't read any synopses or spoilers. I've been mostly excited about new music lately. The new White Stripes, Smashing Pumpkins, Travis, As Cities Burn, The New Amsterdams and several other records on shelves as of late have really encouraged me that the state of music as we know it today has not completely fallen to crap. Then there are bands who - without void of un-warrented hype - have become today's biggest sellers. 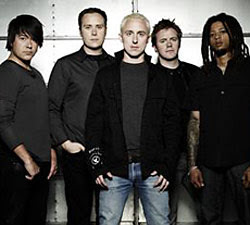 See the above photo of the band Yellowcard. First of all the name is horrible (a poor soccer reference at best), the band hosts a violinist for is screechy sound of pop punk which is a novelty at best and at worst makes the music even worse with Irish-jig-esq violin howling behind the less than tolerable vocals and to top it off a sincere (at least for this year) following of teenies waiting in the wings of concerts with their parent's money hoping to buy everything with the band's name on it. Yes, this is a rant, but as encouraged as I get about music when really good new music comes my way, I still feel like there is a steamy pile of crap around every corner and in every FYE. Just because Spin.com cannot go one day without writing about Tegan and Sara does not make them good. Actually, if I can say one thing about Tegan and Sara is that they are ALL hype. Moral of today: Don't buy the hype. Buy good music. Oh and if you would like to know what I think "good music" is just email me and I'm glad to spend some time shelling out opinions. 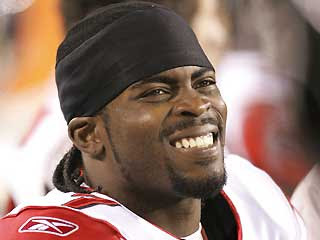 It looks as if Ron Mexico....um....I mean Michael Vick is faced with a potential year in prison. He has until tomorrow morning to accept or reject the plea and according to the Atlanta Constitution-Journal Mexico is waiting to hear back from the NFL to see what their action would be if he were to plead guilty. My only question is, "how can he *not* plead guilty?" What a creep. I've been enjoying reading blogs from gamers who are refusing to play Vick for the Falcons on the newest John Madden Football video game. He made his bed, now it's time to sleep in it. There's a lot of horrible news today. An Earthquake in Peru that left over 300 people dead and many more without homes. A few more bodies were found in automobiles pulled from the wreckage in Minnesota. More than 500 are dead this week in Iraq as a result of a string of strategic bombings. All of this is horrible, negative news, but important that we know about it. It's not important that we know whether or not Britany Spears smokes around her kids or not. In music, As Cities Burn released their newest record "Come Now Sleep." It is absolutely amazing. After the departure of their lead singer and bassist the guys could have easily collapsed. But they didn't and actually came out stronger with a record that is promising to be one of my favorite records of the year. Seriously. I've also had a few days to dig into the latest Bright Eyes record "Cassadaga." I think (only think at this point) that this is Conor's best recording effort to date. He's magically (and thankfully) lost that shiver in his voice that made him sound like he was standing on a glacier or in a sub zero freezer. He is finding a consistency with major chords. See Conor, it's ok to enjoy life and music. My trusty Netflix cue so wonderfully delivered one of my favorite movies of the year to my house this weekend: Hot Fuzz. Not only is there cameos from the likes of Steve Coogan (aka Alan Partridge) but this is one of the more perfect spoof films I've seen since Spaceballs or Young Frankenstein (both products of Mel Brooks' genius). From the lighting to the editing, the character names to the on-screen rapport between characters, every little detail is perfect and hilarious. I'm also getting completely sucked in to "Three Nights in August" by Buzz Bissinger. You may know Buzz from a little book called "Friday Night Lights" or numerous articles in Sports Illustrated. 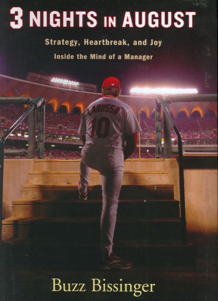 He a great writer who took the better part of a baseball season - the longest season in professional sports, he notes - to dig into the psychology, strategy and pure, dumb luck that goes into managing an MLB team, in this case the St. Louis Cardinals. Bissinger dissects a three-game series for one of baseball's most impressive rivalries against the Chicago Cubs. It takes a strong focus to really crunch each sentence of the book but it's extremely worth it. I'm sure there will a least one more blog about this book. I'm only partially into it and I'm excited about the rest to come. I finally finished "Into The Wild." I absolutely loved this book in its entirety. 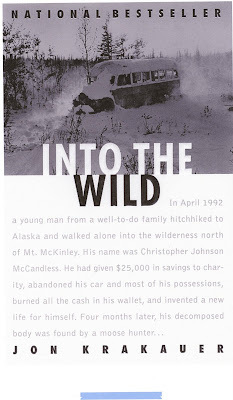 Krakauer's writing style is something to be envied and the story of Chris McCandless is inspiring and intriguing. Through re-telling the story of McCandless, Krakauer tackles the deeper, existential questions about life, like "What are we here to accopmplish?" and "What is absolutely necessary for me to live?" All great questions that reach deep into anyone who even thinks about their past, current and/or future lives on this earth. I only hope that Penn doesn't ever-dramatize the story of a man who wanted nothing more than to be simple and alone. Mr. Barry Bonds set the all-time record for most homeruns, ever! Not a small feat, indeed. Now, all that dumb talk about cream, clear, anabolics, whatever is just tired and people need to get over it. None of that will take away from the fact that Bonds is one of the best batters to step up to the plate in the major leagues and done so with longevity, power and, yes, a great deal of attitude. I say "Congratulation, Barry. You are one of the greats." I'm pretty excited about the new Receiving End of Sirens record "The Earth Sings Mi Fa Mi." It releases this Tuesday, Aug 7 on Triple Crown Records. You can listen to a couple of the tracks HERE or head to their site to listen to samples of each song on the record. In weird, industrial-esq music, Davey Havok and Jade Puget of AFI have collaborated on Blaqk Audio. It's not really that great in my opinion. But it could be huge in Germany. Many people in my close circle of friends and acquaintances are talking about Ron Paul - 2008 Presidential Candidate. I'm not sure how I feel about him personally. Some things I like initially is that his stances are bold and firm. He doesn't seem to be talking around the issues like boarder patrol or the Iraq war. He's 71 years old. Maybe this has something to do with his age. But it's a good thing to be a firm politician. I personally get tired of candidates talking around many issues. There seemed to have been a lot of that in the YouTube debate. One thing that scares me is that Paul claims to be a constitutionalist. I couldn't pinpoint the words to use when discussing this, but I overheard it in conversation last night. Paul's stance in seeking a "limited constitutional government" can be a bit "isolating." That certainly does not weaken his stance, but it can push potential voters / believers away. And one thing I'll hate to see is Paul being 2008's Ross Perot or Ralph Nader, pulling votes away from a better candidate. Man, my head hurts thinking Presidential elections this early, but I thought I'd chime in a tad while it was on my mind.